Kids have loved our best-selling All-Surface Swingball game for years. It can be set up almost anywhere, its lightweight carrying case becomes a super-sturdy base when filled with water or sand. 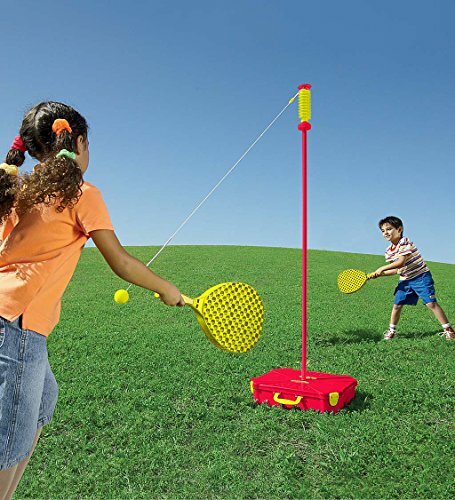 Position the base on grass, pavement, or patio, insert the steel pole, attach the tennis ball on its nylon tether, and volley the ball back and forth with "checkerbat" racquets. Tether can be adjusted to spin freely or travel up and down the pole's corkscrew-shaped sleeve. Pole is adjustable up to 5-1/2" H. Adult assembly. Sorry, gift wrap not available. For ages 6 and up. Tachikara STBR-P extra soft tetherball (pink).